Immigrant Medicine is the first comprehensive guide to caring for immigrant and refugee patient populations. 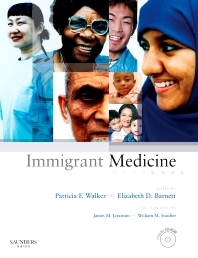 Edited by two of the best-known contributors to the growing canon of information about immigrant medicine, and written by a geographically diverse collection of experts, this book synthesizes the most practical and clinically relevant information and presents it in an easy-to-access format. An invaluable resource for front-line clinicians and other healthcare professionals, public health officials, and policy makers, Immigrant Medicine is destined to become the benchmark reference in this emerging field. Features expert guidance on data collection, legal, interpretive and social adjustment issues, as well as best practices in caring for immigrants to help you confidently manage all aspects of immigrant medicine. Includes detailed discussions on major depression, post traumatic stress disorder, and issues related to torture so you can effectively diagnose and treat common psychiatric issues. Covers international and new-arrival screening and immunizations offering you invaluable advice. Presents a templated diseases/disorders section with discussions on tuberculosis, hepatitis B, and common parasites that helps you easily manage the diseases and syndromes you are likely to encounter. Provides boxed features and tables, differential diagnoses, and treatment algorithms to help you absorb information at a glance. Includes a CD containing multi-lingual health education sheets and links to further multi-lingual resources so you can easily educate your patients. James M. Jaranson, MD, MA, MPH, Consultant, Division of Epidemiology and Community Health, School of Public Health, University of Minnesota, Minneapolis, MN; and William M. Stauffer, MD, MSPH & DTMH, Assistant Professor, Department of Internal Medicine, Division of Infectious Disease & International Medicine, School of Public Health, University of Minnesota, Minneapolis, MN.